I am a history lover. I saw this book and got excited. Most of the people I know on the other hand wouldn't take a second glance at this book. 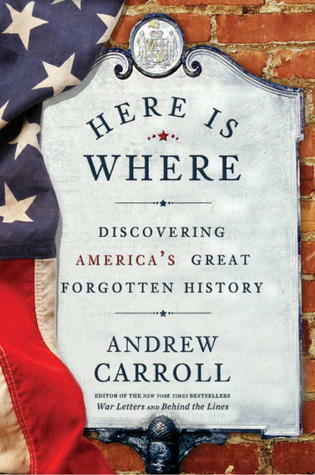 If you really enjoy history you will enjoy this book. It is a lot longer than I thought it would be and it's told in two parts. The author writes about what is going on while searching historical sites, then he continues on with what happened in the past. I liked this idea because it tells the reader what the current location is like and puts a better spin on reality. Here is a quote that was in one of the stories that rings true, "There are some aspects of our history, I think, we'd just rather ignore." I enjoyed this unique peek into little known events and people that didn't make it into the history books. If you like historical facts, pick up this book. Great review! My son eats history. I am definitely going to look this one up. Thanks! Hi Kelly, Thanks for commenting! I really enjoyed this one. : ) Thanks for the follow as well!